Have you every wondered where the middle of New Zealand is? Nelson claims to be the centre of New Zealand but this is not entirely correct. In the early days of European settlement in New Zealand, independent surveyors made isolated surveys that were not connected up. In the 1870s, it was decided to connect these up by a geodetic survey (one that takes into account the curvature of the earth) and John Spence Browning, the Chief Surveyor for Nelson was the only surveyor with the practical experience to do the job. Because he was located in Nelson he was instructed to begin the job here and to extend the survey south to the West Coast. Later it was connected up to surveys from Canterbury. Using the triangulation method to make the survey, John Spence Browning took the easily accessible Zig Zag track to the summit of the Botanical Hill and made this the starting point for the apex of his first set of triangles. The base line for the triangle was laid out in what is now Rutherford Street, between Examiner St and Haven Rd and this is why Nelson was deemed to be the middle of New Zealand. Then in 1962 the Department of Scientific and Industrial Research conducted a gravity survey that took in Stewart Island, the North and South Islands, and the smaller inshore islands, but not the Chathams. This survey located the centre of New Zealand at 41deg. 30min S., 172deg. 50min E., which is a point in the Spooners Range in the Golden Downs Forest. 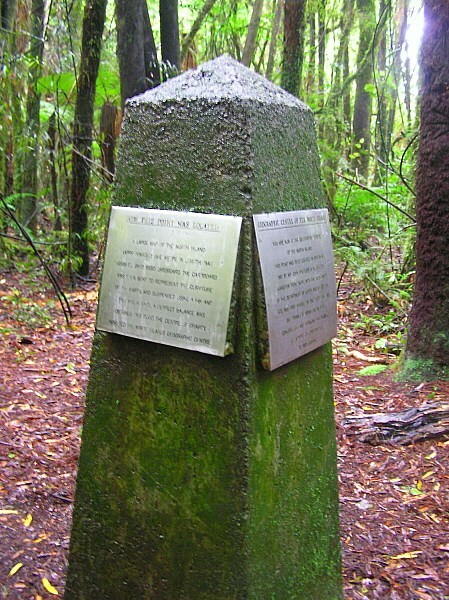 The geographical centre of the North Island is marked by a plinth that lies deep in the Pureora Forest north-west of Lake Taupo. This is not too far from Waimiha where I was brought up on our family farm but I never knew about this then. At the”centre” is a plinth with two engraved plaques. the plinth can be reached easily along a bush walking track, a short distance from the carpark, after a long drive into the forest on a rough gravel road. Follow Link Road until you reach a signpost for the Centre of the North Island. Not literally, but The Lord of The Rings has made New Zealand “Middle Earth” after the filmwas released in 2001. More than 150 locations throughout the country were used to film The Lord of the Rings and The Hobbit Trilogy and a tourism boom has seen many of these become ‘must do’ experiences for film enthusiasts.